Nike is one of several big-name stocks set to post earnings results over the next few trading days. 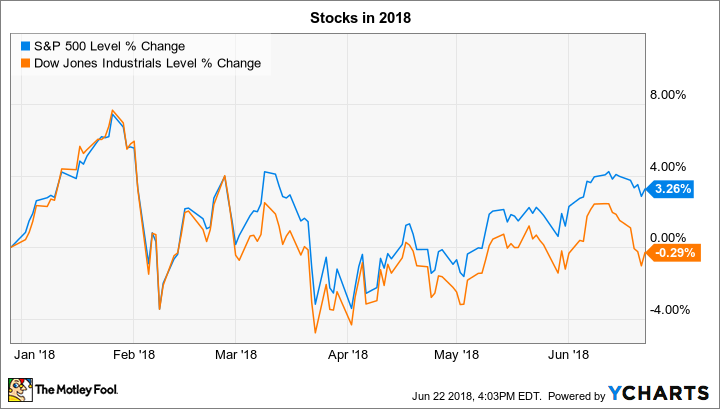 Stocks declined last week, and the drop pushed the Dow Jones Industrial Average (DJINDICES:^DJI) back into negative territory while leaving the broader S&P 500 (SNPINDEX:^GSPC) up just slightly for the year. The week ahead brings several highly anticipated earnings reports from leading companies, including Carnival (NYSE:CCL), Nike (NYSE:NKE) and Constellation Brands (NYSE:STZ). Below, we'll take a look at few important trends that investors will be watching in these announcements. Cruise ship specialist Carnival will kick the week off with fiscal second-quarter earnings results on Monday. Business has been good for the industry leader, and in fact sales rose 4% last quarter to significantly outpace management's forecast of an increase of between 1.5% and 2.5%. Carnival's costs expanded at a slower pace, which helped adjusted net income jump to $375 million, or $0.52 per share, from $279 million, or $0.38 per share a year ago. CEO Arnold Donald and his team are predicting that cost growth won't be quite as subdued for the full fiscal year, but their latest forecast still calls for sales gains of about 2.5% in 2018 compared to a cost uptick of about 1%. They said back in late March that bookings were trending roughly equal to the prior year despite higher ticket prices. Investors are hoping those positive demand trends continue into the back half of Carnival's fiscal year even as the company prepares to deploy 18 new ships over the next five years. Nike steps up to the plate on Thursday, when the footwear and apparel giant is set to announce its fiscal fourth-quarter results. Investors have pushed the stock higher over the last few months on rising optimism about an impending rebound in its core U.S. market. The numbers didn't show much evidence of that recovery at Nike's last quarterly check in, as sales dropped by 6% in the U.S. segment. However, the company did report surprisingly high profitability, and management said they noticed a sharp uptick in demand during the last few weeks of the third quarter. "We now see a significant reversal of trend in North America," CEO Mark Parker told investors. That trend should result in at least a flat sales performance in the U.S. market this quarter, which would pave the way for a return to growth in fiscal 2019. Meanwhile, Nike's success in international geographies, especially China, has given management confidence to predict strong gains in profitability and sales in the coming year. Investors will likely get more specific guidance on each of those metrics on Thursday. Alcoholic beverage specialist Constellation Brands will announce its earnings results before the market opens on Friday. Its most recent fiscal year hit all the right notes for investors: Sales and market share both spiked and profitability set a new high thanks to the company's focus on popular premium drinks, particularly imported beers. Constellation Brands is predicting slower earnings growth in the new fiscal year, with its 10% earnings increase marking the first time in six years that profits haven't risen by at least 20%. That deceleration is in part due to higher marketing spending in support of innovative product launches, including the national launch of Corona Premier. We'll get updates on that product's release this week, along with updates on the company's other long-term growth initiatives, including its aggressive capacity expansion project.